Park Ridge, Ill. (June 2, 2010) - According to a report in the Journal of the American Medical Association, nearly one in three American children are overweight or obese, which increases their risk for developing obesity-related chronic diseases such as diabetes, high blood pressure, heart disease and cancer.1 New research in adolescents demonstrates that a protein-rich breakfast, containing eggs, improves appetite control and additional research shows that a higher protein diet may help obese adolescents manage weight. "We observed that eating breakfast, regardless of composition, led to increased feelings of fullness (satiety). However, when the adolescents ate a breakfast rich in protein, they also experienced a reduction in hunger, thus maximizing the beneficial effects of protein," says Heather J. Leidy, Ph.D., assistant professor at the University of Missouri and study author. "This study supports similar findings in adults that showed that when adults ate breakfast meals containing high-quality protein foods, including eggs and lean Canadian bacon, they had a greater feeling of satiety throughout the day compared to when protein was eaten at lunch or dinner." "These findings are important because they arm teens and their families with practical advice that can be implemented at home," says Dave Ellis, R.D., C.S.C.S., a nutrition consultant who works with athletes and families. "Protein-rich foods, such as eggs, can keep individuals satisfied longer, helping them consume fewer calories throughout the day." Kids and teens need protein to grow and stay healthy. High-quality protein food sources like eggs provide the building blocks they need to grow and the energy they need to stay focused throughout the day. As the school year comes to a close, it is important to set healthy summer habits, starting with a nutrient-rich breakfast. Mini Breakfast Pizzas  - Top a toasted English muffin with pizza sauce, scrambled eggs, a sprinkling of cheese and a dash of oregano for a breakfast even the pickiest eaters will love. Breakfast Quesadillas  - Quick breakfast quesadillas with a little cheese and Canadian bacon are sure to hit the spot. Speed things up by scrambling your eggs in the microwave! 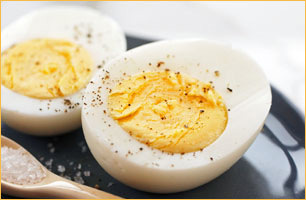 Hard-cooked eggs  - Hard cooking eggs ahead of time is a great way to save time during the week. Just slice and add to a sandwich or eat as-is for a nutritious start to the day. Eggs are all-natural and provide one of the highest quality proteins of any food available. In fact, the quality of egg protein is so high that scientists historically have used eggs as the standard for measuring the protein quality of other foods. One egg provides more than six grams of protein, or 13 percent of the Daily Value (DV) or Daily Reference Value (DRV) . While many people think the egg white has all the protein, the yolk actually provides nearly half of the protein content. 1.Ogden, C.L., Carroll, M., Curtin, L., Lamb, M., Flegal, K. (2010). Prevalence of High Body Mass Index in US Children and Adolescents 2007-2008. Journal of American Medical Association, 303(3), 242-249. 2. Leidy HJ, Racki EM. The addition of a protein-rich breakfast and its effect on acute appetite control and food intake in ‘breakfast skipping' adolescents. Int J Obs 2010. Accessed 5/18/2010. 3. Krebs NF, Gao D, Gralla J, et al. Efficacy and safety of a high protein, low carbohydrate diet for weight loss in severely obese adolescents. J Pediatr 2010. Accessed 5/18/2010. New research in adolescents demonstrates that a protein-rich breakfast, containing eggs, improves appetite control and additional research shows that a higher protein diet may help obese adolescents manage weight.